Basically, when you go to Google maps you have, for places that support it, a new option next to map types, and it’s called Street View. What you get is a little person icon which you can drag around on the map and just drop where you want a photographic street view. 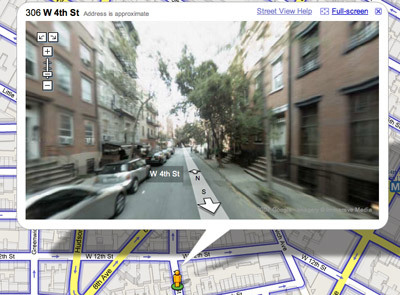 Within the street view you are presented with, you can then zoom in/out, turn around or go forward/back up. This is completely outstanding! Thank you, Google, for constantly blowing my mind! Ya it’s very cool… Google rocks! Yet that guy Ryan doing the intro sounds drunk.. ha ha 🙂 or either he’s not impressed dressing up like that LOL. I added here the best Google Street View (28 views and more after …). Yeah, it's awesome. Also, if you're interested, this is the camera behind Google's Street View. Thanks for the tips, guys! Glad you enjoy the feature/service too. You can at least see some pictures in for example Stockholm using hitta.se. There are some valid points in that post and the poster is not paranoid. I wonder how this is addressed legally – if the image of some child drew the attention of a pervert for example and the child became a victim because of the exposure (ie sico gets caught and says yeh I saw her on google street view shopping for victims). Often we're fast to employ technologies before the ethical and security considerations are fully understood. Another example is RFID. I was at a lecture by Professor Sakamura, the RFID guy who developed it, and he said (last year) we are 10 years away from addressing the ethical and security issues of the technology. Another concern of course is the creation by our own consumeristic demand of an infrastructure Homeland Security would love – a more truely Orwellian society. That's not paranoid either actually. As a technologist and as someone interested in development I can't help being amazed at the usefulness to myself and others of this information provided by applications such as street view and everyscape. Also, are we even capable of saying no to being observed and photographed by Google anymore? Are they now just too big? Thanks for the tip (PS. I think your link text got stripped since there weren't any text or closing of the actual link, i.e. <code>a</code> element)! Thank you for the information, it is an interesting link. And I agree with Steven, the writer is not paranoid to me. Naturally, pictures might be taken of something/someone that should never be published and have terrible implications. I guess the main problem is that is in a grey area, legally, and absolutely that we're more bound to introduce new cool stuff before maybe thinking through all aspects of it. My belief, though, good or bad, is that as long as it isn't plain out illegal, it's inevitable that we will see these services popping out (even though they indeed can be a threat to integrity.) What's the option for Google Street View? To only publish images where there aren't any people in it? Maybe… But probably practically impossible. an option might be to utilise some kind of artificial intelligence algorithm which looks for human features and matts them out to the median colour range – kind of making people into cartoons. Therefore taking their identifying features from the photograph… I'd suggest at this level Google would be just plain lazy or dont' think its important enough to warrant the extra development. But it can be done. I'm pretty sure there are other ways to pull people out of photographs as well if it comes down to it – Google being rather rich and all some R&D could be invested if they so desired. That is a very interesting suggestion, and I agree: such measures should definitely be taken. It is really cool, but it have not google API documentum? On this google site i don not found….